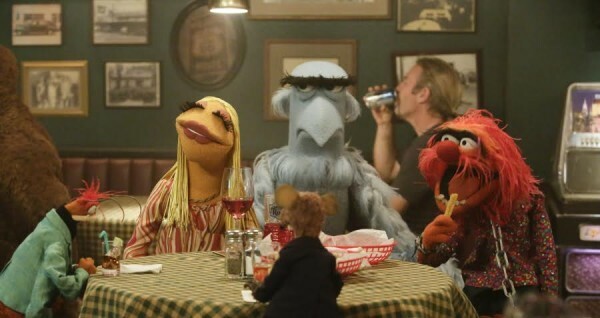 I love the Muppets, I can’t say I have seen everything they have done but I did watch the new series on ABC The Muppets. It’s sort of a mixed of there old Muppet show mixed with 30 Rock. One thing that I noticed was Sam the Eagle crushed on Janice. Sam the Eagle is uptight and Janice is a free-spirted hippie new age gal. Now you look at these two and tell me don’t get Frollo and Esmeralda vibes. Sam the Eagle even has a tonsure and Janice has a tan. Sam the Eagle stalks her a little bit and in the Christmas episode waits by the mistletoe from her, he doesn’t get it but he gets a peck later in the episode. I will say that Sam does have more game than Frollo and Janice is nicer to Sam than Esmeralda is to Frollo. I just loves seeing this type of pairing in the show. They NEED to a Hunchback or Notre Dame de Paris skit with these two.